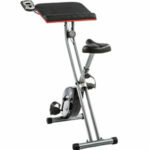 Does The INTEY Magnetic Resistance Exercise Bike Help At Home? 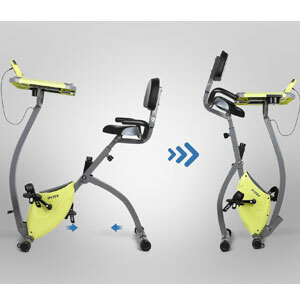 The INTEY Magnetic Resistance Exercise Bike is one of those devices that immediately stands out when browsing products because of its look and function. It is clear straight away that this isn’t like other exercise bikes or office exercise machines. It has a strange design, with promises about productive work sessions and great workout. So what actually happens when buyers climb aboard this machine? 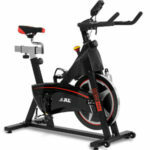 What are the pros and cons to this INTEY Exercise Bike? The main benefit to this INTEY Magnetic Resistance Exercise Bike is the clever blend of the tough bike and well-designed workstation. Exercise bikes with desks aren’t always the toughest of machines. That is because there is that blend between an easy workout, with simple motions, and the need to focus on work. 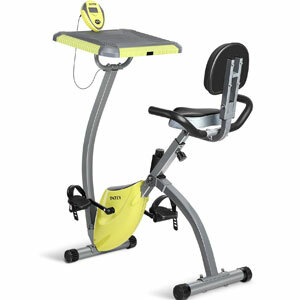 Here there is a different approach as the exercise machine is the priority, with the workstation coming in second. There are some great reports from users that are surprised at how tough it can get. This comes down to the use of adjustable resistance on the pedals. This is not the only adjustable aspect of this home exercise bike. The frame adjusts to help different users find a comfortable posture. This includes the position of the desk too. The gym bike is the star here, but there are some nice details to the table too. The shape and size is just right for some light work on the laptop, and the rubber surface helps to stop laptops from sliding around. It isn’t designed as a desk substitute for lot of items, but it does the job for a short period. Some simply use it as a place to read a book or watch a tablet while working out. An additional bonus in this design is the pull-out drinks holder. The problem with this INTEY Workstation Bike is that is can be fiddly to put together. Many buyers actually seem more keen to talk about the assembly and construction than the workout. Despite all the parts and adjustable aspects, it isn’t as fiddly as it may appear. However there is a lot to get right and the parts in the box can seem overwhelming. Some say it takes as much as 45 minutes to completes, others as little as 15. There are also those that were confused to find half the fixtures pre assembled when trying to count bolts and screws. Summary: Does this lack of negative feedback means that the Magnetic Resistance Fitness Machine Bike Trainer is recommendable? The assembly issues in user feedback aren’t enough to detract from any recommendation for this product. Users may find it takes some careful assembly, but the effort spent is worthwhile. The end result here is a product that is a little different and takes a current workout fad to a new level. 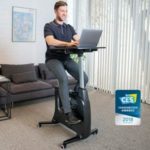 Both the bike machine and workstation are impressive, and there is the sense that many at-home workers will feel the benefits with this INTEY exercise bike. Find more reviews about the INTEY Exercise Bike For Home With Desktop on Amazon here.